As I wrote in the previous blog posting, Austin Chapman starts with a clean slate. He has the benefit of exploring new sounds and new music through his new ears based on its reputation and the recommendation of others. Whichever sonic avenues he chooses to explore will be off-ramps from those original tracks he’s been recommended. He will be listening to a lot of good stuff, no doubt, but he will be taking a few wrong turns along the way, too. Austin doesn’t know this yet. His taste has yet to be defined. Not so with me: My taste is settled, my preferences defined. I know what I like, and like most people I’ve long learnt to predict the audio contents based on visual cues such as packaging and text. Not only is this skill useful, I’ve honed it even further by forcing myself to listen to more music over the last 15 months than you can shake a baton at. I’ve been exploring new music by listening to old recordings. Gratis. There was no need for services like last.fm, drip.fm or Spotify to “suggest” what I might like (or might like to buy) based on past listening or purchasing habits. I didn’t have to be online to do so, nor do I need to waste time managing a bunch of files or synchronising devices so I can listen to compressed audio through pathetic little ear buds or tinny speakers via an overpriced phone while sitting in a noisy train all the while worrying about dropped connections, my precious data plan or when I last charged my iTablet. But not me. I’m smarter than that, I worked it out. I went retro and asked for tapes. And I got plenty. For free. Peter Gabriel’s “Passion” soundtrack-themed album, for example, was a sheer revelation. Van Halen’s “1984” is back on my neglected CD-shopping list. I’ve re-discovered my fondness of the Kinks. And although I knew almost all tracks on Prince’s “Purple Rain“, I only recently got to listen to the entire album as a cohesive unit — the way it should be. Over and over, on auto-reverse. It’s stunning, as is Santana’s legendary 1970 “Abraxas” album. At the other end of the scale it turns out that I prefer Rossini and Vivaldi to Mozart and that there’s more to André Rieu than his smug grimace. Even audio-books opened a portal to a hitherto ignored dimension — I now understand why C.S. Lewis’ writing came to be so popular. And all this via a condemned medium called “cassette”: tapes nobody wants anymore, discarded matter, unwanted media on an obsolete and superseded carrier which a decreasing number of people even own a playback device for. More exciting was that several of the tapes were brand new, unopened and unwrapped, often still with the original price sticker affixed which, if adjusted for inflation, reveals that it really is cheaper to buy the corresponding CD today — assuming they’re not cassette-only releases. 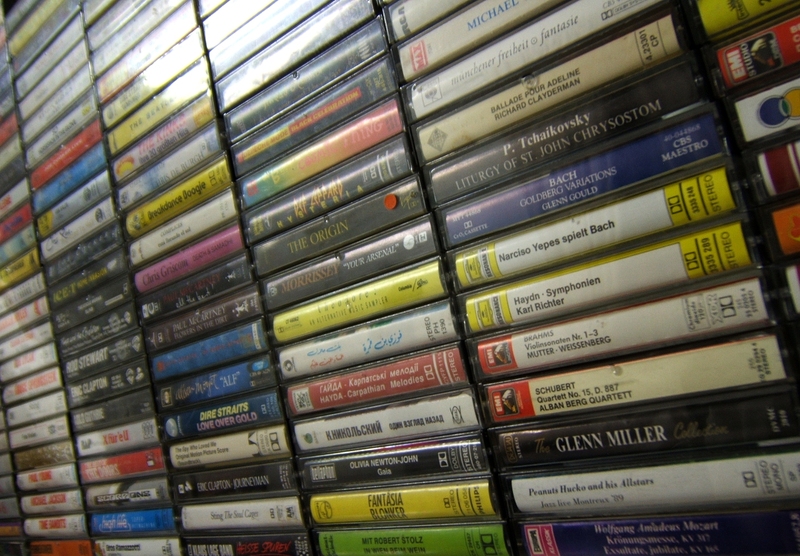 A digital replacement via iTunes or similar online store, on the other hand, might end up costing you even more, and then you’re stuck with it for life: because, legally, you’re not allowed to give it to someone else — and you can certainly forget about re-selling your unwanted, 2nd-hand MP3 files! What irks me to no end is that humankind has devolved to the point that there’s no real, legal way to share or pass on your “own” music recordings to someone else unless it’s on outmoded physical media. Exploring the past, our heritage, has become a tedious and expensive undertaking — assuming you can find these recordings available at your favourite online store to begin with. Searching through a store or other such site is so, well, sterile and condescending. There’s no rolling up your sleeves to do some down and dirty crate digging, there’s no real randomness or element of surprise when you stumble across strange items such as a mixing desk or a radio station promo, or advertising for snake oil recipes and pyramid schemes. Of course, and let’s be honest here, I wouldn’t voluntarily be listening to donated rubbish like “Musik mit Herz” if there wasn’t some purposeful motive behind it. The motive, in this case, was to explore. Explore, disseminate, scan, categorise, and catalogue is what I set out to do with all this old junk before it finally disappears off into the large recycling plant in the sky. Because if I didn’t, there’d be little trace online that the Nikolauspflege foundation for the visually impaired in Stuttgart has a singing group — and this is known only because they decided to record a tape in 1999 which somehow fell into my hands. 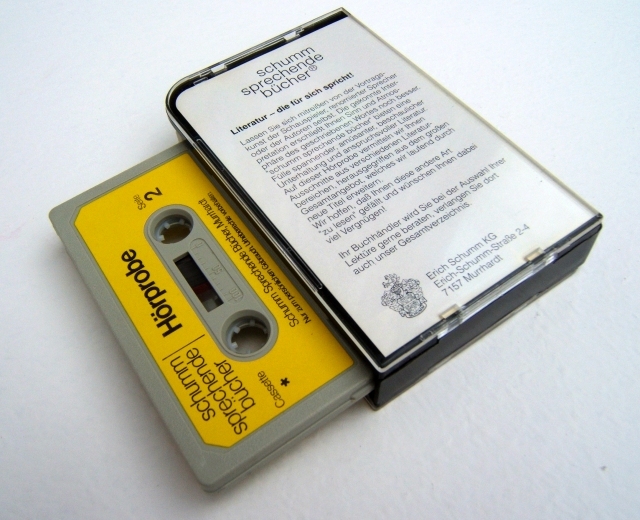 If I didn’t, the history of recorded audio might have forgotten that it was one Erich Schumm who introduced the idea of audiobooks (“talking books”) to Germany in 1978, he being the same entrepreneur who patented something as banal as the common fly swatter — a peculiar connection made via the promotional tape in its unusual box pictured below. Each tape (and by extension every other media carrier or even something as mundane as a box of cereal) has a confession to make: not only via the recorded sounds and prose, it also wants to reveal its content, its origins, how it got created, who produced and manufactured it, and the people behind it all. It’s people. Media is my Soylent Green. It’s all about people, and every person has an interesting story that deserves to be told. Profile: Bandoneon player, performer, composer and ambassador of Argentine tango, born September 14, 1929 in a village named Ensanada, Argentina. Growing up in Buenos Aires, young Alfredo was taught the virtues of the bandoneon by his uncle, the well-known orchestra leader Carlos Marcucci. Prompted by the death of his father, at the age of 15 he began playing and touring professionally, and at the age of 18 he joined the orchestra of his other mentor, Julio De Caro. Several other orchestras later (Raúl Camplún, Osvaldo Donatto, Enrique Pranccini, Juan Canaro), he lived the dream of recording with that of the famous Carlos Di Sarli in 1956. Three years later it was dissolved due to ill health, and Alfredo ended up playing bass for a jazz ensemble during a tour of the Middle East. 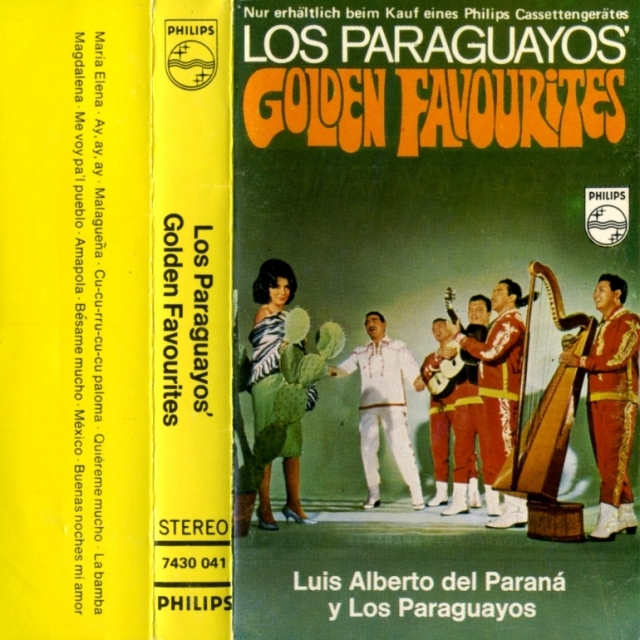 Crossing paths with Luis Alberto Del Parana‘s famous group in Istanbul in 1961, he recorded and toured with the Paraguayos for many years until, in 1976, he decided he’d had enough, hung up his bandoneon and settled in Belgium to devote time to his family and the blue-collar life of a factory worker making plastic lamps. A few years later, Alfredo was coaxed back into the game by local fans and compatriots. He soon found himself opening a music school, teaching tango at the Academy of Ixelles, performing on the European stage with numerous ensembles (including a few stints with Reynaldo Meza Y Los Paraguayos), and recording with Belgian string quartet Ensemble Piacevole. In 2004 he was invited to Turin to train and direct the first Argentine tango orchestra in Italy — which was named in his honour. Alfredo Marcucci passed away on June 12, 2010 in Landen, Belgium at the age of 81. Now that’s an interesting life story, and the “summary” above (with all due respect) was pieced together from fragments of data found on liner notes of records, loose blogs, ex-band members’ memoirs (in Spanish) and anything else the mighty machinery of Google offered — and all this inspired by one random tape. For me, personally, digging through and cataloguing second-hand recordings is an immensely gratifying task, and there must be scores of such treasures that, during their glory days, were proudly displayed in tape cabinets or fancy shelves. Today, these remnants are hidden away in the back of a drawer, stuck in a box under the bed or simply gather dust in the basement as if they had suddenly become that sickly, incontinent parent you haven’t the heart to put into a retirement home. Gramps’ knees and bowels may be giving in but boy, does he have stories to tell! This entry was posted in History and tagged exploration, mortality, music, people, tapes, trivia. Bookmark the permalink.